Though easily marked as a '70s/'80s throwback, "Basement Jack" is about as good a slasher film as you could hope to find in any decade. Tipping its hat to John Carpenter's classic while still relishing in its modernity; "Basement Jack" is a hugely entertaining horror film that acknowledges its influences without being a thing like "Scream". The story follows Jack Riley (the spectacularly creepy Eric Peter-Kaiser) AKA Basement Jack: a silent slasher who takes up residence in the basements of "apple-pie" American families, silently observing their happy lives before putting his favourite blade to use on mother, father, sister, brother, and Spot the dog. His motivation? In true delusional mass-murderer fashion, he has mummy issues. Driven mad by seventeen years of home-cooked electro therapy courtesy of his endlessly charming mother (Lynn Lowry of "The Crazies" and "Shivers" fame) Jack seeks revenge on any family that represents the love and kindness he was denied. Jack tours the country, slaughtering families in every town he visits - but no matter how well you slice-and-dice, there's always one that gets away. Enter Karen (Michele Morrow): the sole-survivor of Jack's murder spree. Each hunting the other, Karen wants retribution for the death of her family, while Jack hopes to improve his bowling average by finishing the job. With the help of a likeable rookie cop (Sam Skoryna) Karen tracks Jack for one final showdown. She must stop him once and for all - or die trying. True, you may have already seen a number of films with a similar story, but the slasher has always been very formulaic, and "Basement Jack"'s plot certainly has enough demented quirks to help it stand out from the regular Myers/Krueger/Voorhees clone. There is tribute, but there's originality too. The film plays well at a perfect 90 minute running-time with gross-out gore scenes, scares, laughs and plot revelations all liberally distributed at the right moments. There's no shortage of highlights, but certainly a newly masked Jack Riley's assault on police headquarters will go down as one of the all time great stalk-and-slash moments, recalling "Halloween 4", "Maniac Cop" and "The Terminator" all at once. It's beautifully choreographed, frantically shot, outrageously gory and sickeningly amusing – not to mention it features the simultaneous deaths of three prominent characters. This is horror back to its old unpredictable self. While producer/screenwriter Brian Patrick O'Toole has a good a track record for horror ("Dog Soldiers", "Cemetery Gates" and personal favourite; "Sleepstalker") – you have to believe that the cast and crew believed in this picture 110%. 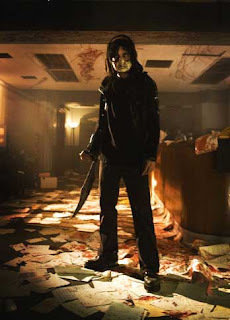 For what is truly a shoe-string budget, "Basement Jack" looks great, possessing almost a Hollywood standard of gloss. This is something a first-time director (prolific FX artist Michael Shelton) simply cannot achieve without the benefit of a crew's love and dedication to a project. Shelton himself is a bit of a revelation, having obviously paid attention during his fifteen year career, his first time behind a camera and he's already showing the spark of a young Sam Raimi ("Evil Dead" trilogy). Keep an eye on this man. Although there's been a few noble attempts to revive the slasher sub-genre (or indeed the horror genre) recently ("Hatchet", "Wrestlemaniac" and "The Tripper" come to mind), none have brushed the cobwebs off the 1980s formula quite as well as "Basement Jack" and certainly none have been so accessible that they might actually pose a threat to the slew of sequels and avalanche of remakes (which I'm not actually all that fussed about) that are dominating the genre – but "Basement Jack" does. Basement Jack Riley is an icon in the making.